We conducted our systematic literature search in the Medline (via Pubmed) and Embase databases, limiting our articles to those added to the database on or before March 20, 2015. 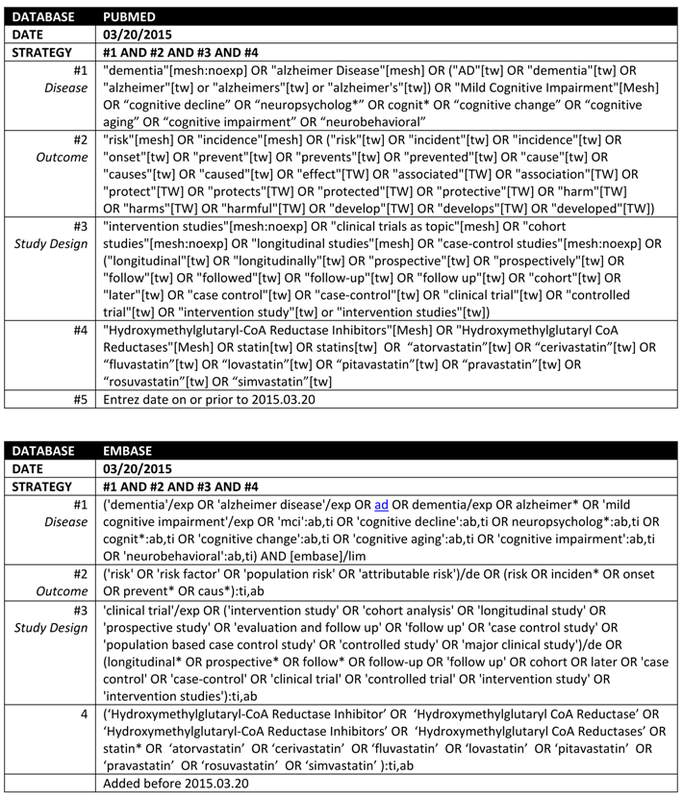 We used the Medline Medical Subject Headings (MeSH) database and the Embase EMTREE thesaurus, as well as relevant article abstracts and metadata, to compile lists of controlled vocabulary and free text terms that were incorporated into our search strategy. Our search terms included keywords for the exposure (e.g., “statins” or “atorvastatin”) the outcome (e.g., “Alzheimer”), and study design (e.g., “cohort” or “case-control”). The search returned 366 citations from Medline/Pubmed and 839 from Embase; 228 duplicates were removed yielding 901 unique citations. 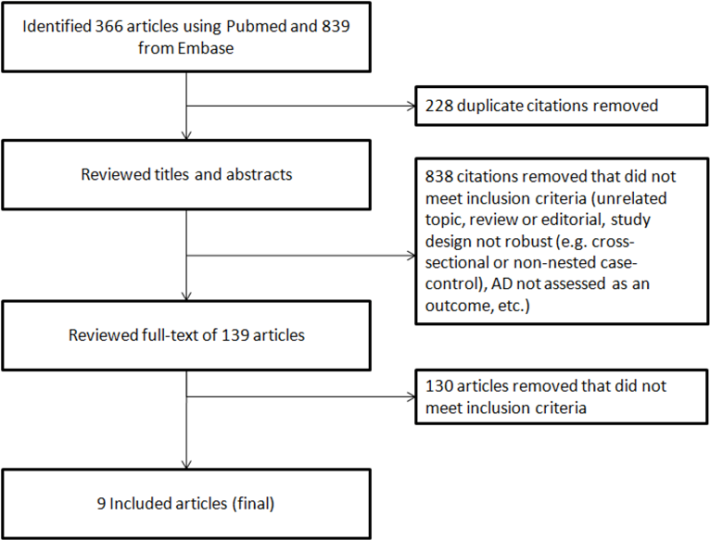 We excluded 838 citations that did not meet our inclusion criteria (e.g., topic not appropriate, review or editorial, cross sectional or non-nested case-control study design), leaving 139 articles for full-text review. We then excluded 130 additional articles that did not meet the inclusion criteria, including three that published statins-Alzheimer’s disease results also published elsewhere in greater detail, leaving 9 eligible peer-reviewed publications. Using our systematic review methods, we developed a search strategy (tables below) for Pubmed and EMBASE.